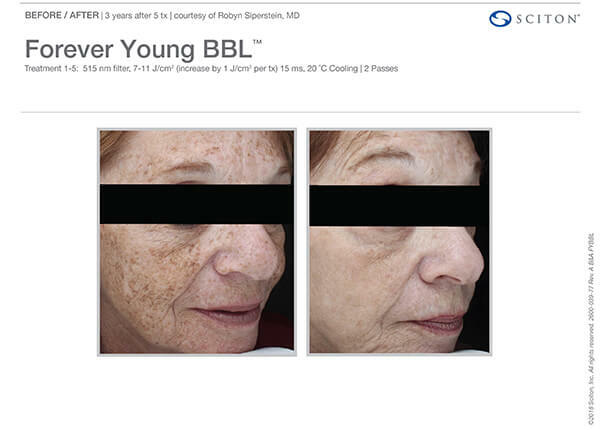 Forever Young BroadBand Light (BBL)™ is a revolutionary technology by Sciton that addresses the subtleties of your complexion on a much deeper, customized level. The Forever Young treatment delivers energy deep into your skin, boosting your body's natural ability to regenerate new, healthy skin cells, while replacing the aging, stress, and sun damaged cells - anywhere on your body. If you've dreamed of repairing wrinkled, discolored or acne-scarred skin on your face, neck, hands, chest, and shoulders this treatment is for you. Forever Young ™ reveals fresh, radiant, gorgeously contoured skin. Take your first step toward reviving the naturally youthful you by calling Meredith at New Life Aesthetics at (919) 521-8282, or fill out the form below. What Is Forever Young™ Broad Band Light Therapy? Forever Young ™ delivers both infrared and visible light energy to gently heat the upper layers of your skin (the epidermis and the dermis). The heat absorbed by the targeted areas will stimulate your skin cells to regenerate, stimulating changes in skin tone, texture, elasticity and pigmentation. By actually altering the genetic makeup of your skin cells, this non-invasive therapy stimulates your body to produce more collagen and elastin - the building blocks of fresh, healthy skin. Gradually, your aging skin cells adopt the behavior of younger ones, reviving your genetically youthful complexion without the risks, costs, or long recovery times surgery demands. What Can Forever Young™ Do For Me? You can still benefit from Forever Young™ even if your skin isn't yet damaged - it can serve as a preventive treatment to maintain your skin's youthful radiance. What happens during my Forever Young™ treatment? First, you'll have a consultation with Meredith to go over your treatment goals and medical history, so everyone's on the same page. Then you'll schedule your procedure. Before entering our skincare suite, please remove all makeup and lotion. Wear loose, comfortable clothing. Males should shave immediately before coming in. Meredith will protect your eyes with safety glasses. You may feel a brief warming sensation as the light is absorbed by your targeted areas. Your procedure may take about 15-45 minutes, depending on the size of the area being treated. This is a gentle, non-invasive procedure with virtually no downtime. In most cases, you're able to apply makeup, return to work, and resume most activities the next day. You may experience some redness or mild stinging that usually resolves by end of day. Sunspots and freckles may turn reddish brown, then begin to flake off within 1-2 weeks. Complete healing typically takes between 1-2 weeks. The skin on your body might take longer to heal than the skin on your face. Once healing and peeling is complete, your pores will be smaller, and your sunspots or uneven pigmentation reduced. Results depend on your condition, the number of treatments, and the area treated. Most patients need a series of corrective treatments though you will notice benefits after each treatment. Maintaining your results with a treatment twice a year will keep your skin fresh and young. As with any medical procedure, treatment results will vary from patient to patient depending on age, genetics, general health, condition severity, follow-up care, and environmental factors. Consult with Meredith before embarking on your treatment journey. Am I a candidate for Forever Young? During your consultation, be sure to discuss any medical conditions or medications you are taking that might sensitize you to light, affect wound healing, or interrupt blood clotting. Be sure to tell Meredith if you've taken Accutane during the past year. 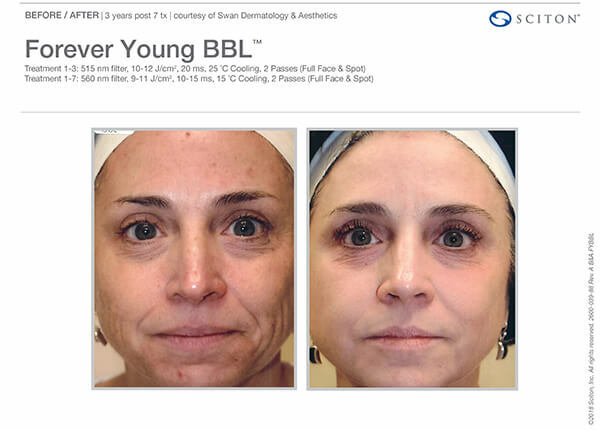 Forever Young BBL™ costs vary depending on treatment location, number of sessions required, and other considerations. To determine your costs, Meredith will consult with you about your needs and goals. Currently, Forever Young is not covered by medical insurance. Your skin is your largest organ - give it the love it deserves. Stop wondering how to get rid of acne scars, how to remove wrinkles, or how to find the most effective dark spot remover for face and neck discoloration. Meredith has done all the homework for you. She's been treating aging, scarred and sun damaged skin conditions for well over ten years, and she understands skin subtleties of any texture, age or ethnicity. She gets just as excited to see that post-treatment naturally gorgeous glow as her patients do! Awaken a brand-new you today, by calling New Life Aesthetics in Raleigh at (919) 521-8282, or contacting us below.